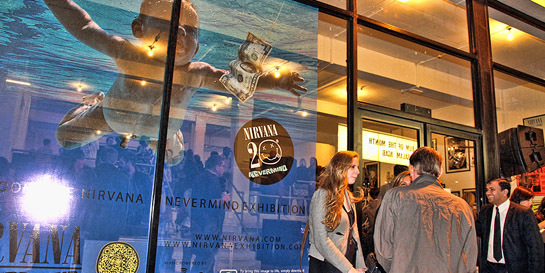 A Tuesday evening in mid-September found me in Shoreditch at the opening of the Nirvana Exhibition, to celebrate the 20th anniversary edition of Nevermind. >> Part 2 - "My chair fell apart from underneath me and I crashed to the floor..."
As I watched Little Roy, a vintage veteran of reggae, perform Nirvana songs, I started to think how much Nirvana had been a part of my life. Not always centre stage, but more like one of those air traffic control maps, full of dots that look random to the untrained eye but make perfect sense to the fat controller. It all started 20 years ago at HMV. I was the singles buyer for the chain, based in the head office - a recent promotion after a few years graft in the Oxford Street store stockroom where I spent my days listening to that week's new releases and inhaling plastic fumes as we shrink-wrapped hundreds of LPs every day. The sales rep from MCA came in for his regular meeting, and he presented Nirvana. I really liked Teen Spirit and our stores were already getting asked about the band, so between us we agreed we'd back the single and I duly placed a large order. That was it, no earth shattering moment. In November I went to see the band at Kilburn National, they were fab, Teen Spirit was released and so began a well documented career. I spent another four years working at HMV and saw the influence that Nirvana had....doors were opened not only for the bands like Pearl Jam, Alice in Chains and Soundgarden but also artists like The Jesus Lizard, The Vaselines, Daniel Johnston and even PJ Harvey. A few years later, after a recommendation from the aforementioned MCA sales rep, I found myself as the Geffen Label Manager in the UK. One of the first artists I worked on was Sweet 79, Krist Novoselic's new band, which saw us at a packed gig at the Cecil Sharpe house in Camden. A strange choice of venue as it was more renowned for folk than a giant grunge super hero but fun nonetheless. I went on to work with Beck, Elliott Smith and Sonic Youth, all of whom in my mind shared an integrity that Nirvana had. In the 00s I was lucky enough to work on the Greatest Hits and With The Lights Out box set and now a full 20 years after the journey began we're almost back where it all started - I'm back in the gallery in Shoreditch, talking with people I've known for decades, working with colleagues stateside and in the UK on the 20th anniversary edition and as excited as ever about the album. Any regrets? Just one really: It would have been nice to have met Kurt the person, rather than be so familiar with Kurt the legend. Tuesday 13th September to Sunday 25th September, open from 1.00pm until 7.00pm daily. The Loading Bay Gallery, Unit 4-5 Dray Walk, 91 Brick Lane, London, E1 6QL.